From I-65 - take the Broadway exit west to 11th St. Turn right until you reach Chestnut (Central High School is on the left.) Turn right onto Chestnut to 10th St. The Library is at the corner of 10th and Chestnut. From I-64 - take the Ninth Street Exit also known as Roy Wilkins Avenue. Go to Broadway; turn right and continue to 11th street. Turn right onto 11th. Once you reach Chestnut, turn right. The library is on the corner of 10th and Chestnut. The Western Library is steeped in historical tradition. At the creation of the Free Public Library system in Louisville during 1902, several African-American leaders, including Albert Meyzeek (Central High School Principal), passionately championed for library services for African-Americans in Louisville. 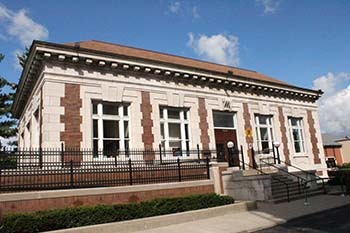 In 1905 the Western Colored Library opened at 1125 West Chestnut Street, the first free public library in the nation for African-Americans staffed entirely by African-Americans. On October 28, 1908, the newly constructed Carnegie Library opened at its current location. The branch was led by pioneering African-American librarian, Reverend Thomas F. Blue. His focus on serving the community was equally important as his work in educating African-Americans in the science of librarianship. His apprentice program for librarians lasted into the 1930s and attracted students from across the south. The Western Library has re-opened after a major renovation with the most significant change being the addition of the African-American Archives Reading Room, which will house the papers of Rev. Thomas F. Blue and the papers of Joseph S. Cotter, Sr. and his son. Mr. Cotter, Sr. was a renowned poet and local educator who sponsored an annual children's storytelling competition. In addition to the historical papers, the African-American Archives Reading Room will house an extensive collection of material focusing on the African-American experience, some items having been published over a century ago. The renovation of this historic building was funded through a combination of federal and state funds, with additional support from the Library Foundation. To see photos of the grand re-opening, click here. The Blue papers can be viewed now, as they have been digitized and can be accessed at the KVL: Kentucky Digital Library website. For more more related to the history of this Louisville landmark, visit A Separate Flame - Western Branch: The First African-American Public Library.